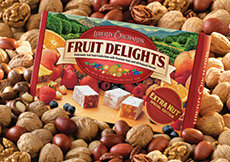 Orchard-grown nuts make an appetizing gift! 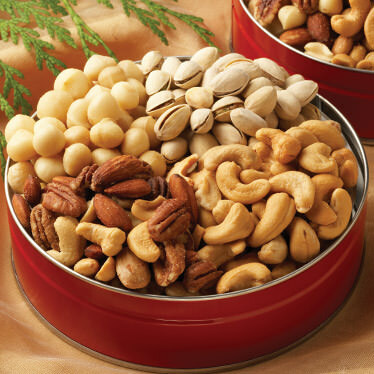 Our tin is filled with four varieties of premium nuts (Deluxe Mixed Nuts, Giant Cashews, Pistachios, and Macadamias), or individual tins of Deluxe Mixed Nuts or Giant Cashews. INGREDIENTS: Deluxe Mixed Nuts cashews, almonds, pecans, hazelnuts, macadamias, peanuts, Brazil nuts, partially hydrogenated soybean oil, salt. INGREDIENTS: Giant Cashews jumbo cashews roasted in peanut and canola oil, salt. INGREDIENTS: Macadamia Nuts whole macadamias, salt. INGREDIENTS: Fancy Pistachios natural undyed pistachios (dried roasted), salt. 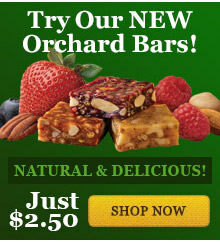 These products should be enjoyed right away, but may be stored at room temperature for up to four weeks. Keep away from heat. Tightly seal with plastic wrap after opening.